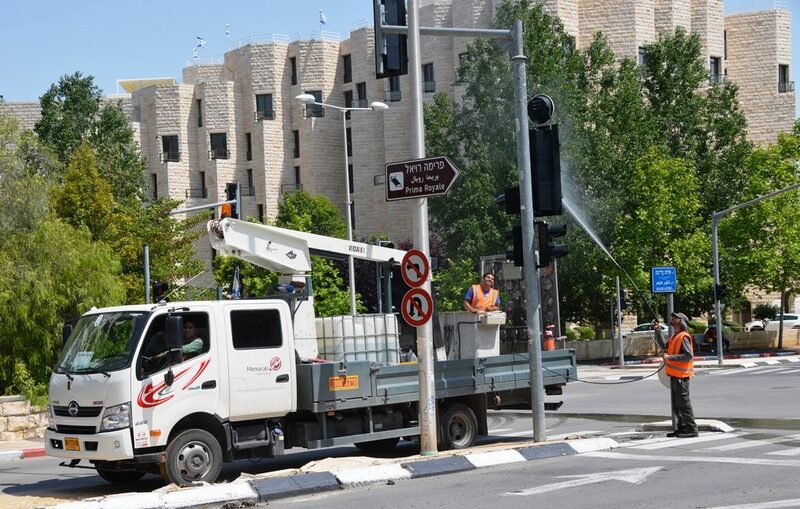 After heavy rains, blue skies were seen again over Jerusalem, Israel, by the end of the week. 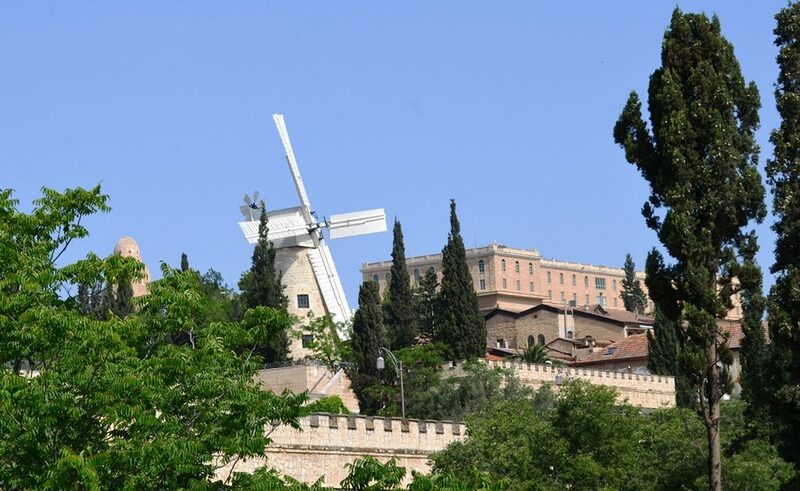 Friday morning, in spite of rain in the forecast, the Montefiore Windmill, with King David Hotel in the distance, stood against the blue sky over Mishkanot Sha’ananim. 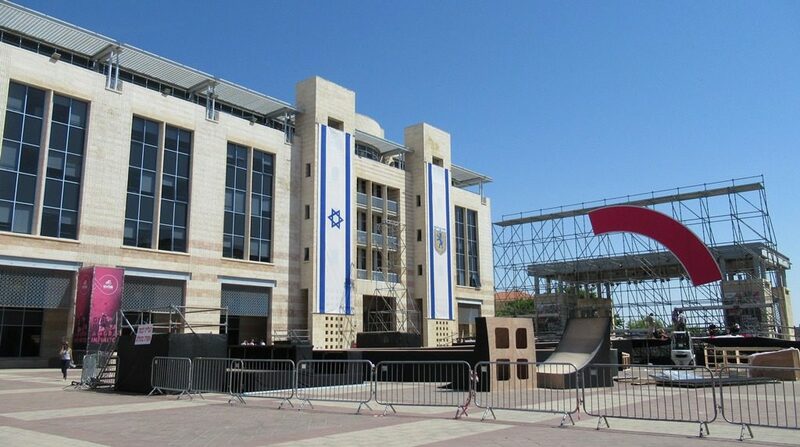 After Yom Ha’atzmaut, Independence Day 70 years, flags did not come down. 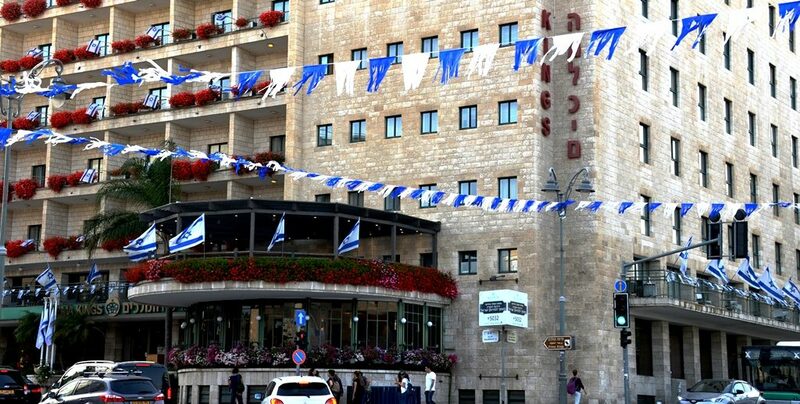 Even more blue and white flags have been hung in anticipation of Yom Yerushalayim, Jerusalem Day. 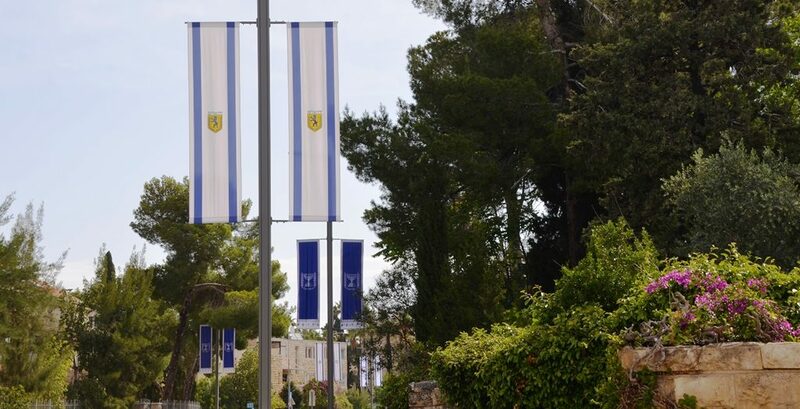 The new flags that were hung near Beit Hanasi, the Israeli President’s Residence, withstood the heavy rains. 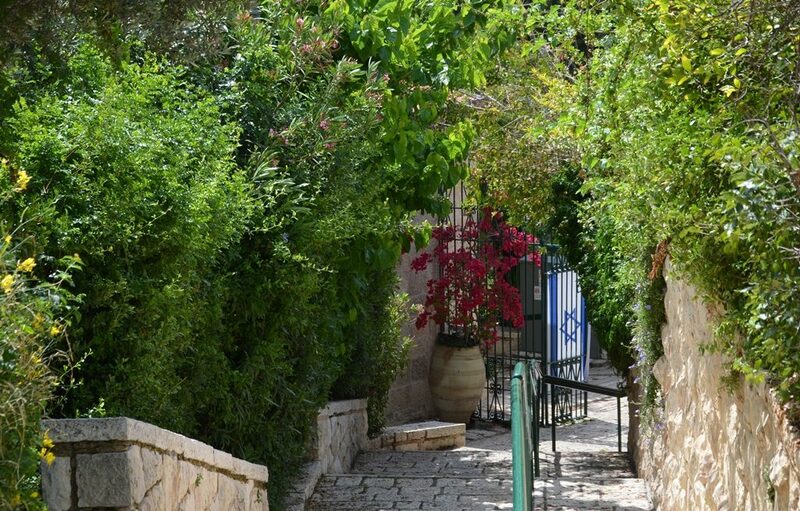 This blue and white Israeli flag was hung on a gate in Yemin Moshe neighborhood. But also on Friday morning there was evidence of the rain storms. 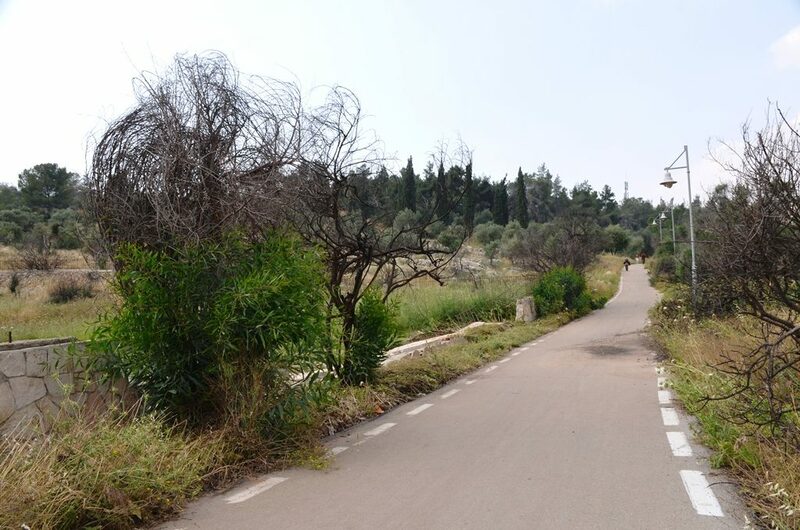 You may have seen a video of water rushing through Yoel Salomon Street, carrying tables and shopping carts in the flooded road. 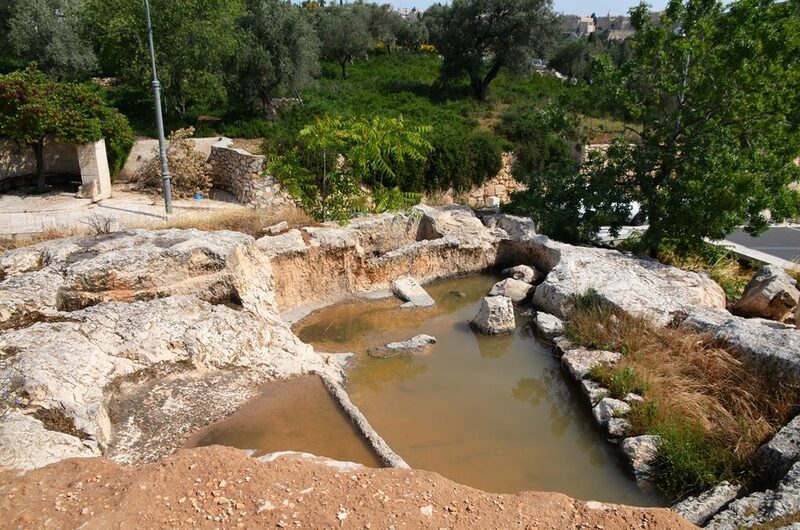 Here in the Valley of the Cross, part of a stone fence fell down. I could not believe it the first time I saw the damage. It looks like heavy trucks hit it. 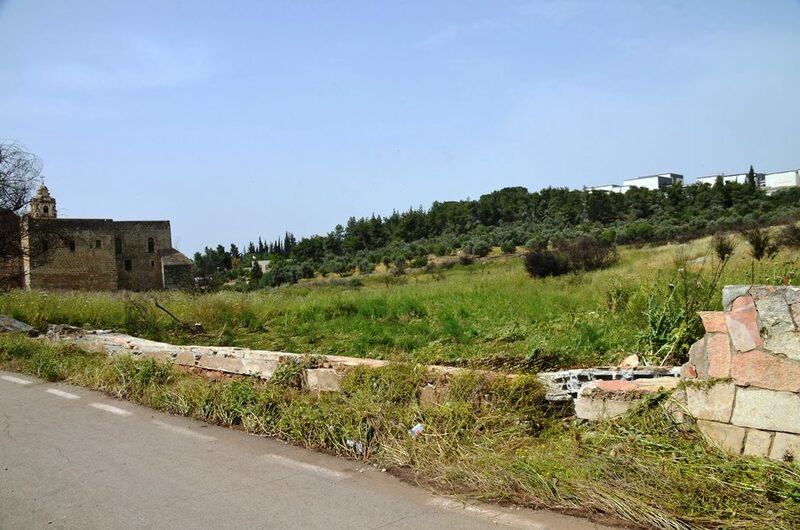 However, it appears two days of water flooding down the hill from the Rechavia neighborhood pushed over the old stones, and flattened the tall grass. A flash flood in the south took the lives of 10 young Israelis. 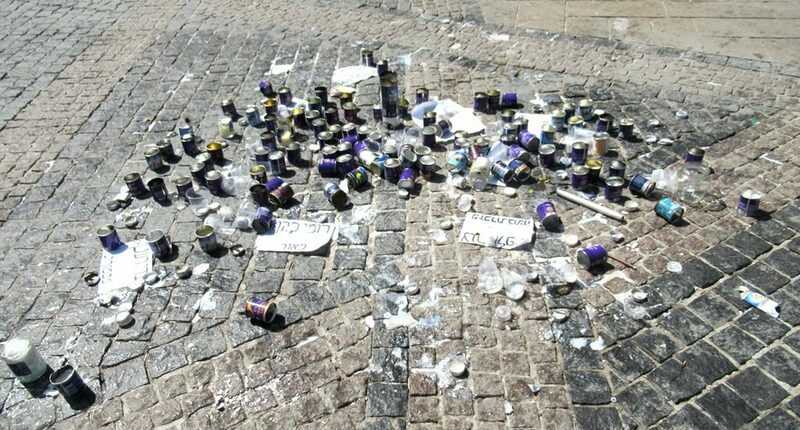 Memorial candles remain this week in Zion Square after a late night memorial gathering. So after so much water, crews were out power washing traffic lights? These flowers seemed to appreciate the soaking. Nearby in Gan Sacher, Sacher Park, a large tree that fell was removed quickly. In spite of the weather, professional cyclists were out on Friday morning for the Grand Fondo, GFNY. Streets were closed for the cycling event. But, their colors were green. 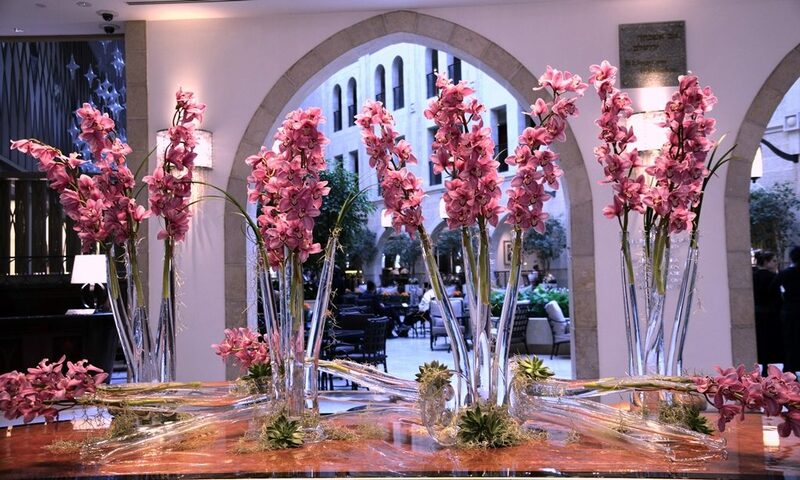 Pink orchids in the lobby of the Jerusalem Waldorf Astoria are not unusual. 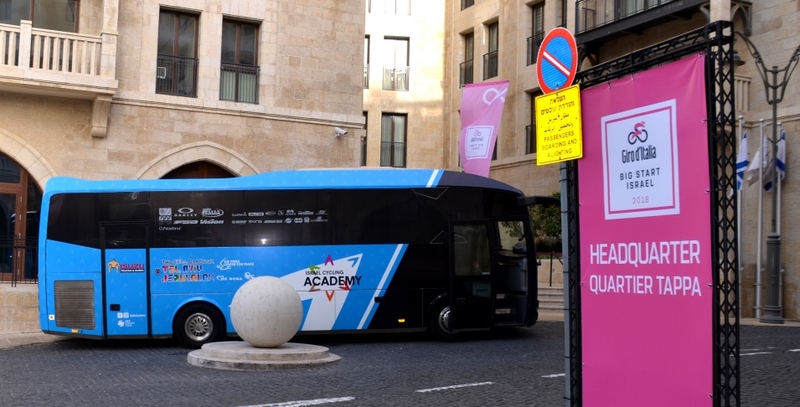 But the Giro d’Italia is based at the hotel, and the bus of the Israel Cycling Academy was waiting outside. 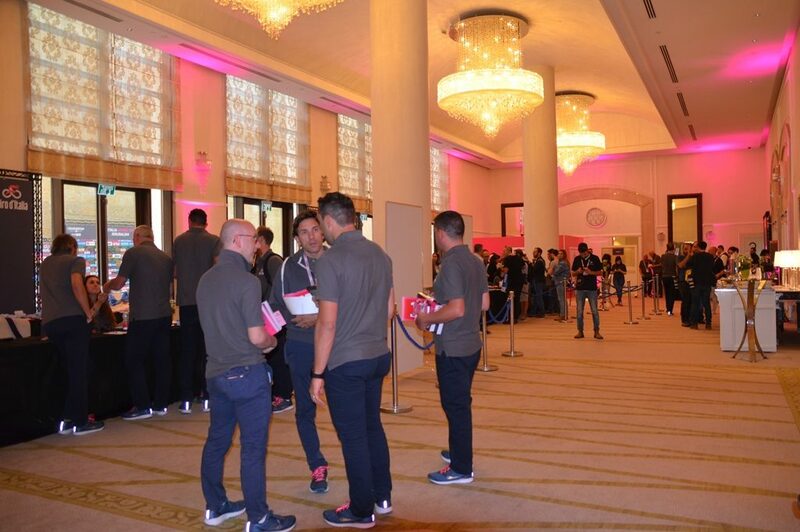 Not only has the hotel gone pink for the Giro d’Italia, check out those shoe laces – pink. The Giro d’Itaia is the 3rd largest sporting event in world, after the World Cup and Tour de France. The first start ever outside of Europe is taking place in — Jerusalem, Israel! 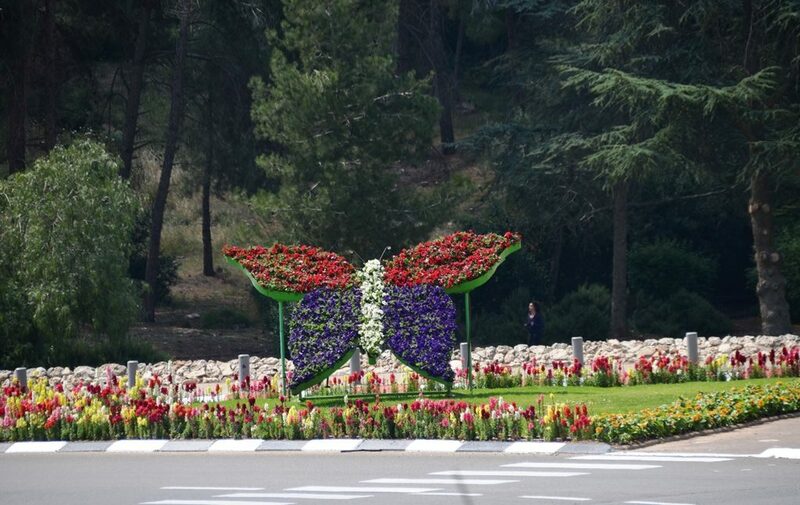 Kikar Safra has large blue and white flags on display, plus pink signs near the giant stage set for Thursday evening’s preview opening. 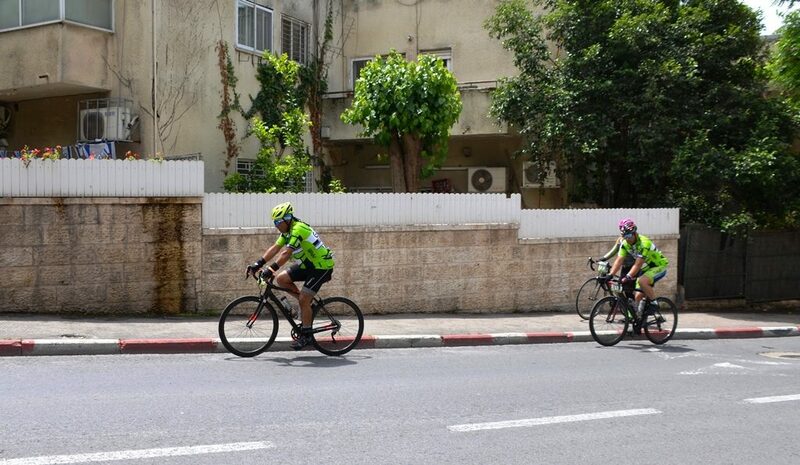 The Israel Cycling Academy includes professional cyclists from 16 locations around the world. 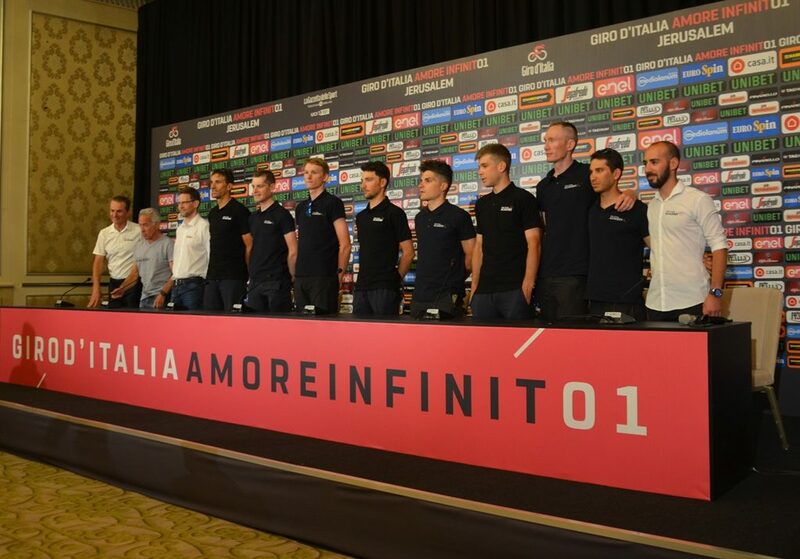 Eight professional riders met with the media. Their success in a only a few years is impressive. More here and next week on Giro d’Italia. 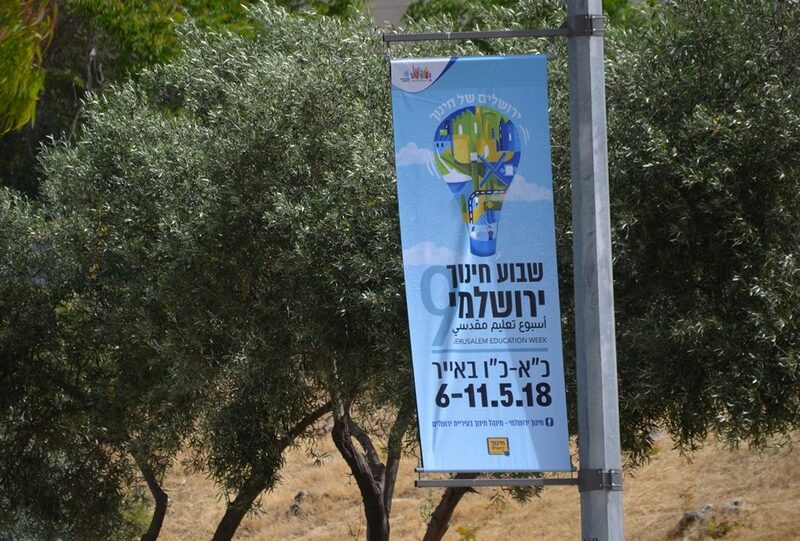 Also in Jerusalem, new signs are up for education week. Finally, one of my favorite scenes from this week. 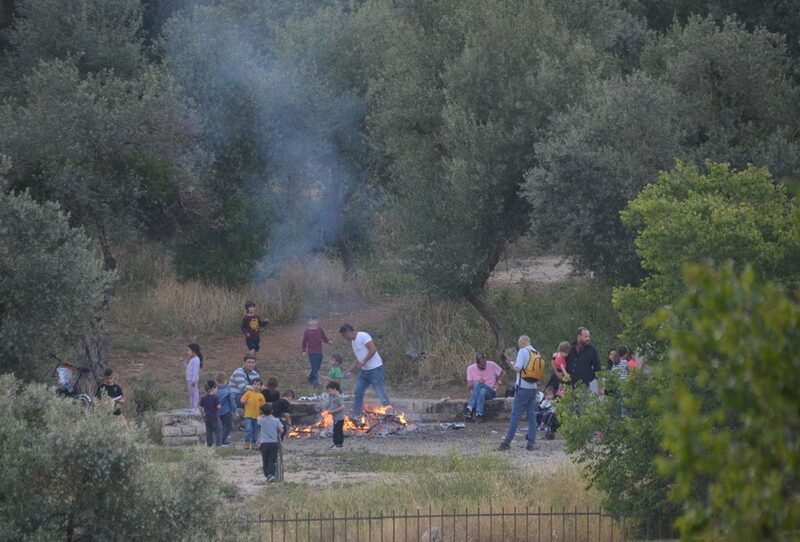 A group of parents were out in the evening supervising an early Lag B’Omer medurah in an area set aside for large bonfires. Lag B’Omer with its huge fires should fill the air with smoke starting Wednesday night at sunset. However, this year, though there was so much rain last week, it is hot and dry today. A ban on bonfires has been declared. Rain is again in the forecast. The only thing for sure here, is that there is no sure thing. 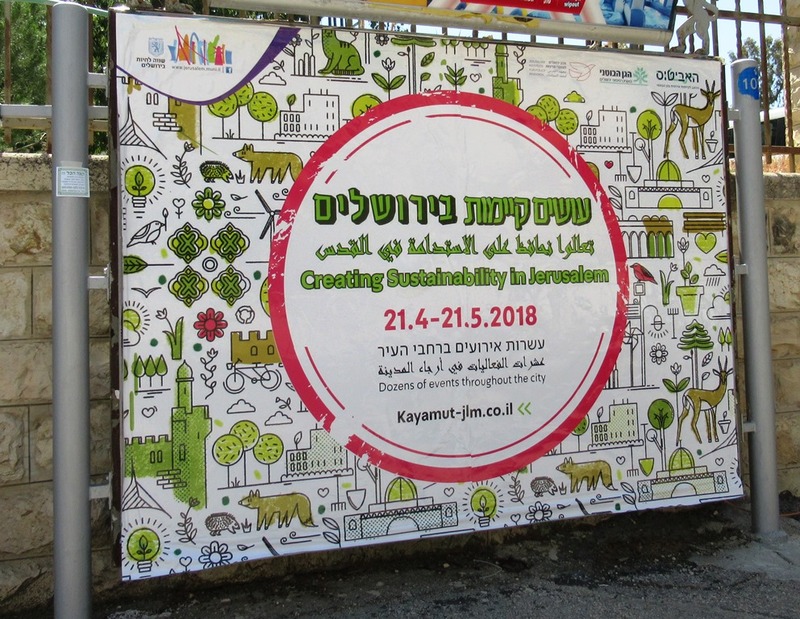 New signs announcing events for “Creating Sustainability in Jerusalem” were posted. Cycling and fewer bonfires are a start. Many residents are not happy with street closings for the cycling events. 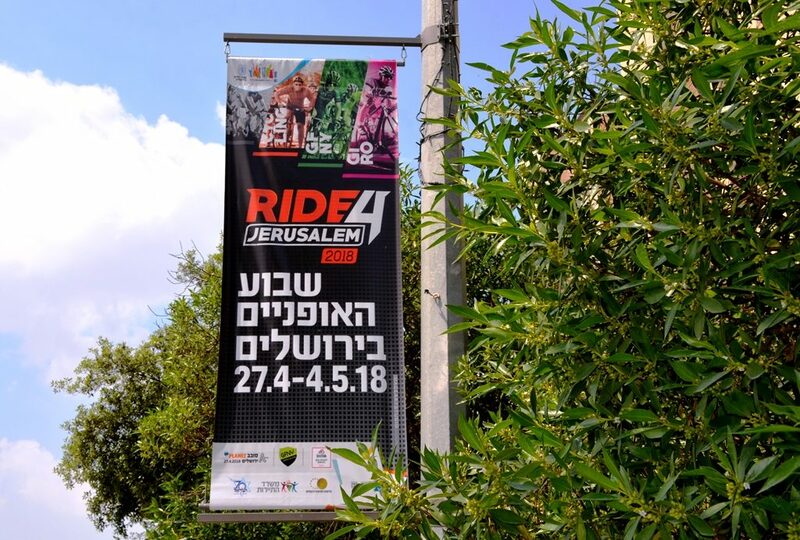 But I hope people will get out and appreciate the positive world attention focused on Israel as billions watch the Giro d’Italia Start in Jerusalem, going north and then down to Eilat. There was so much more happening this week in Jerusalem, but enough for now. Hard to believe that next week will there will be much more happening.